Well folks it appears some of that heat that has been held off most of the summer has finally arrived here in San Diego, c'mon did ya really think we would avoid it? Uhh, don't think so, even while our normal steamy-hot August weather came and went with a whimper. I was thinking huh, where did our heat go, were we going to escape our long overdue summer heat wave? C'mon this is San Diego and we know heat like Eskimos know ice, and like Ned in the show Pushing Daises, who quickly learned that if something is revived for more than exactly one minute, something of similar "life value" in the vicinity drops dead, as a form of balance in our causal universe. With that said I think it's high time to get out and "smell the roses" or Rosé wines while our weather is cooperating with a nice heat wave, that just screams for sipping freshly chilled Rosé pool-side or on the bay! Thus it's with our weather, we all know our summer in San Diego was for the most part dreary thanks to some guy [wet blanket] named Coastal Eddy, while the rest of the country [at the time] was baking in very high uncomfortable temps. 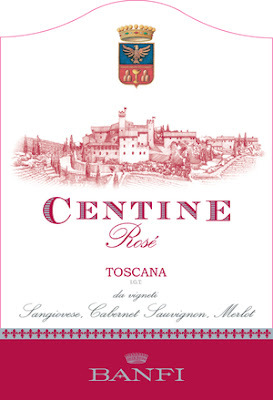 So while some of you may have enjoyed our local cool temps, just remember our hottest and driest times of the year are typically in October and it's with that in mind that I wanted to bring to your attention Banfi's Centine Rosé, perfect for quaffing on what will ultimately prove to be a long warm week [I'm no weather man, but I know San Diego] thus it's the perfect time to add a cool rosy glow to a hot day with the 2009 Centine Banfi Rosé. Don't Despair: I did take a look at the 10 day forecast and it looks like a cool down is on the way. But in the mean time grab some of this bright sunny weather while you can and a bottle or two [or even a case] of this wonderful rosé which is sure to bring a smile to your face and get you back in the pink. Not your Mother's White Zin: The heat is on here in San Diego and it's time to "Think-Pink"! No, not the low alcohol, sickeningly sweet “white” zinfandel brought to you by bulk-wine producers like Sutter Home, Gallo and Beringer, strangely tasting more like a soda only without the straw. It's also not the Portuguese Mateus and or Lancer’s you blew your cookies on in your teens. Oh no, these wines are an entirely different animal, by contrast you will find most Rosé wines today to be surprisingly bone dry – though this is usually offset by the refreshing acidity, they tend to be full-bodied, rich, sometimes spicy, carrying a hint of alcoholic clout in tow. This Banfi Rosé Sangiovese dominated blend is made in a distinctively bright, modern style – dry and a little savory, with mouth-filling red fruit flavors, crisp acidity, delivering refreshing finish and low in ABV at 12.5% under a Screw Cap closure which helps to maintain freshness and vibrancy in the bottle even if you don't polish it off that day. The Grapes: So ya wanna know the blend recipe? Well word has it that it's made from 60 percent Sangiovese and 20 percent each of Cabernet Sauvignon and Merlot or as it's sometimes commonly referred to as a "Super Tuscan"
Food Pairings: It can be thought of as "ideal" as an aperitif type of wine, [just before dinner] but I find this wine to be the perfect picnic partner or pool-side companion, so grab yourself some fresh cheeses, charcuterie and some ripe fruit like strawberries or plums. I think you will find this fan-freaking-tastic pairing as long as you keep it chilled, but not too cold or you'll lose the flavor. Price and Where to Find: This drink now and drink often wine sells for a measly SRP of $11 most places and you can find this wine widely distributed to many grocery type stores in your specific neighborhood. 1) Always buy the youngest vintage available. Despite possessing both acidity and tannins, the fruit disappears quickly from a rosé style wines. So drink now and often for best results. 2) Chill out please and keep them chilled [easily done with a frozen sleeve]. You'd be amazed how rapidly a perfectly fruity rosé can lose its appeal and turns alcoholic as it warms up in the glass or in the bottle. Full Disclosure: Hello FTC and anyone else who could be interested, yes this wine was a sample sent to the Cuvée Corner Wine Blog for the "review" process. Cuvée Corner Wine Blog Score: Hey point seekers here's my score if your interested: This wine scored 90 points on the Cuvée Corner 100 point scale. An enticing introduction to the fine quality wines of Tuscany and more specifically Banfi and [IMHO] represents a great quaff for very few bucks! Other Voices: Just in case you don't want take my word for it, I found some other folks around the web who have oddly echoed my own opinion, that this wine is a QPR champ!